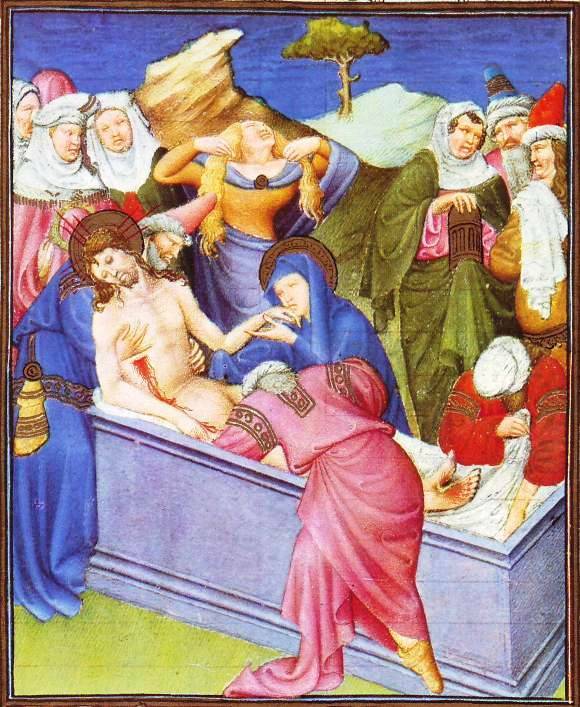 Christ is lowered slowly into the tomb – not a 1st century Jewish tomb, but a medieval European one. Joseph of Arimathaea supports the torso, an assistant in a rose mantle bends down to take the weight of the legs, and a man in a turban kneels at the feet and pulls on the winding sheet. The mourner in a drab green mantle holds the necessary spices in a golden box. At the head of the tomb one of the holy women holds the Crown of Thorns, which later became the most precious relic of the Sainte-Chapelle in Paris. Mary of Nazareth kneels, supporting her son’s arm. She is as pale as the lifeless hand she presses against her cheek, reluctant to let it go. The intense blue of her mantle and that of Joseph of Arimathea frame the corpse. The wild despair of Mary Magdalene contrasts with the quiet sorrow of the Virgin below her. She throws back her head and, like a mourner in the Lamentation, tears at the long golden hair which she had once used to wipe the Savior’s feet. The jagged peak behind echoes her agitation. The violet of the Magdalen’s mantle repeats, at a deeper level, the color of the tomb, and leads the eye back through a gap between the ﬁgures into the landscape beyond.